I’d so far thought that it was Jia’s The World (2004) that truly summed up the state of the third world in the first decade of the new century. While I’ve not changed my opinion entirely, Wang Bing’s phenomenal DV work Tie Xi Qu: West of the Tracks (2003) forces me to. Epic in scope and size, West of the Tracks is divided into three films subtitled Rust, Remnants and Rails. Between 1999 and 2001, when China had embarked on a mission of mass privatization of the country, Bing lived and shot this film in the district of Shenyang located in the city of Tie Xi in northeastern China where smelting and electrical industries were to be closed down. These industries were purportedly established by the Japanese to help them produce ammunitions for the war, but were nationalized after Japanese retreat. Although these factories were doing well till about the eighties, the profits started waning by the mid-nineties (due to bad management, some workers say) and, by the end of the decade, the factories had filed for bankruptcy resulting in mass layoffs and appalling cuts in pay of the workers. The film is a Herculean effort by a single man, who is credited as the producer, director, cinematographer and the editor of the film (which is ironical considering that this is the kind of film that tries to efface authorship). Bing apparently shot several hundred hours of footage for this film and edited it secretly and illegally in a TV studio. The result is one of the greatest films of the decade. Rust, the longest of the three parts of this monumental work, opens with extended tracking shots photographed from a train that succinctly sum up the nine-hour film that is to follow. The snow-tainted lens of the handheld camera tells us the attitude of the filmmaker towards his subject – that of a empathetic and trustworthy observer who will place himself amidst the people he will be documenting – and the train, which comes to a halt after trudging through the snow-clad premises of the Shenyang smelting complex, itself becomes a fitting metaphor for the underproducing factories that will soon come to a full stop. In Rust, Bing chronicles the everyday life of the workers at the copper, iron and zinc smelting factories of Shenyang and through it, the failure of a utopian socialist dream. A large part of this section gives us workers going about doing their routine – unloading the metal ores, refining them, operating the blast furnaces and processing the extracted metals – and relaxing at the break rooms where they play chess and mahjong, involve in verbal fights and talk cynically about the state of the factory. This technique is crucial for the film since it is this very technique that aids the film to abstain from making any overt political statement and helps us empathize with the workers’ plight and way of life. It is this experiential mode of identification that justifies the running length of the film too. Had Bing cut down the film to a more viewer-friendly runtime, the product would have been a more analytical and agenda-driven film rather than a humanistic work that it is. It is in these decidedly mundane sequences that we witness how inhuman the work at the factories is. The communist dream of the glorious worker seems a mere propaganda when one observes what happens at these industries. We are told that the lead content in the factories’ atmosphere is hundred times the allowable limit. The workers later go to a hospital to rid their bodies off the poison that they have taken in from the factory. The machines have literally infested their lives. The workers have become functional accessories required to keep the machines running, literally and figuratively (This personal sacrifice asked of people for a supposedly greater good – a motto that seemed common only to totalitarian socialist regimes – manifests in even more objectionable terms in the second part of the film), but they would have to almost kneel begging for pension before the government. The toughest part in this whole ordeal seems to be to come to terms with the fact that the faith that the workers had towards their government turned out to be an act of naïveté. Rust is the least narrative of the three segments and it is indeed tough to get hold of a perspective through which you can assess the happenings. In fact, the only probable protagonist of this section is, like Tsai’s cinema hall, the industrial complex itself. The complex, through its days of glory and disgrace, appears to denote the death of a civilization – from being a place full of people and public baths to a cold, deserted wasteland. After the industry is shut down, one of the workers, ransacking the now-empty break rooms, finds the identity card of a worker among the debris. We do not get to know the name on the card. We needn’t. It’s the condition of all the industry workers at Shenyang. 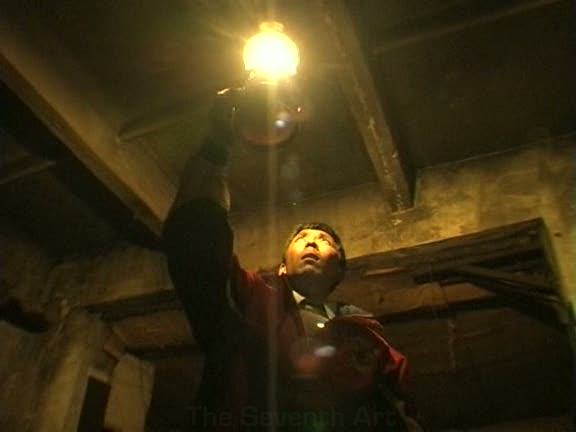 The three hour long second segment of the film, Remnants, takes place in the residential complex that houses the family of the workers at the Shenyang factories. Bing employs the same identification technique as in the previous film, following a large number of people living in the area and getting us accustomed to the way of life in the place. The first hour mostly deals with a bunch of teenagers knocking about the township during Valentine’s Day without any apparent work or education to care about. Some of these directionless youth take to violence and turn hoodlums for petty sums of money. It is in this infinitely rich segment that the film opens up numerous avenues for analysis of class, crime, justice and human rights. Like the Shenyang industries, the residential complex is to be torn down as per orders and is to be replaced by privately constructed and owned chain of apartments. Some of the residents, who realize the power of the institution they are up against, decide to dismantle their own houses (like the workers who take the industries apart), sell off whatever scrap metal that remains and move into the criminally unfair amount of compensatory space they are being allocated elsewhere. In that regard, the dilapidating neighbourhood that they live in becomes highly expressionistic and indicative of the moral and psychological downfall they are experiencing. The more gutsy ones, on the other hand, decide to stay put and force the private organization and the government to give them their due. The latter retaliates by cutting off the town’s supply of water and electricity. The people, again, try to obviate the need for electricity by harnessing daylight as much as possible. Like the gestures of these people, Wang Bing’s film is also an act of resistance, of documenting what remains unheeded and unsaid and of rethinking accepted notions of progress and development. His refusal to stay with the people who don’t leave instead of those who move on clearly exemplifies his stand. What we see in this second segment is the same kind of human rights violation that takes place in every developing country around the world, be it due to the Three Gorges project in China or the Narmada project in India. There are only a few films such as Jia Zhang-ke’s Still Life (2006), Yu Yan’s and Yifan Li’s Before the Flood (2007) and Simantini Dhuru’s and Anand Patwardhan’s Narmada Diary (1995) that act as voices of resistance amidst the cries of national glory and pride. The important thing to recognize is that these voices exist and need to be heard. One old man in Bing’s film, who is on the verge of throwing in the towel, tells us that we “can’t hold back the tide of progress”. One might call the statement cynical or practical, but the point is that an attempt should be made, even if in vain, to hold the tide back so that there are no more such tides. The third segment of the film is called Rails and charts the final months at work of the employees of the Shenyang Railway system that manages shipments into and out of the district. This section could be seen as a conglomeration of the first two in the sense that it deals with both the workplace and the residential space of the workers. It is also in this segment that Wang Bing gives the film the semblance of a narrative and boils his character set down to two people – Old Du, a coal gleaner working in the railways with the cooperation of the workers who run the trains, and his son Du Yang. The driving force of this segment is the arrest of Old Du by the railway authorities which causes Yang to break down from his passive state. In the film’s most affecting sequence, Bing photographs Yang in his house on the day following his father’s arrest. Yang shows us a bunch of family photographs, talks about his mother who has left him alone and, just when the clock strikes ten and a melodious tune plays, starts crying. It’s a divine moment in filmmaking. Not once does Bing use non-diegetic music in the film but just at the moment when Yang stands on the verge of a breakdown, the clocks chips in with its heartwarming music (Bing reflexively pans to reveal the source of music, as if vindicating himself!). Earlier, Old Yu tells us: “There aren’t many people who would be willing to live the way we do”. It’s a devastating statement that shows how deep the social ladder descends. As such, West of the Tracks (and Fengming: A Chinese Memoir more so) does not have a premeditated aesthetic that imposes an external meaning on the reality of the film. The cinematography and editing are almost purely functional and there is barely a cut or a reframing that suggests personal authorship. The film seems to lie so close to the end of that Bazinian asymptote to reality, that it opens up possibilities to read life as art, even if the filmmaker does not intend to create such a meaning. One might say that the naked men who walk around on screen are suggestive of the workers’ identity being stripped down to nothing, but it is only their workplace routine. One might say that the workers are dwarfed and marginalized by the humongous machines they are working on, but it’s just a material truth. One might say that the wife swapping story that the workers share in good jest has considerable parallels in their national politics, but it is just small talk that they indulge in. Same is the case for the trains that often switch tracks. What West of the Tracks does is to create that essential distance between reality and art to give us (pardon the pun) a better picture of ourselves, to create poetry from everyday activities, to aestheticize life. But more importantly, the film makes a strong case for DV filmmaking. Bing’s cinematography is entirely handheld and he prefers to shoot from amidst the workers and from their eye level. Only Digital Video could have provided this material flexibility for Bing. He religiously performs the role of a historian, capturing passages that would otherwise be relegated to the level of footnotes. He neither exploits the grief of the people he’s filming to create his art nor does he try to analyze their situation and make an overarching statement. He merely lives among them, staying in the sidelines with humility and standing witness to the downward spiral they are thrust into. This way, Bing’s film makes a strong case for cinema itself, taking it closer to what it out to be and what it was devised for – to capture and save reality from destruction, negligence and falsification. Really, really excellent piece, JAFB. Looks like this is not on Netflix, but I will keep it on my radar. I’ve just been discovering Jia’s work lately, and loving it. This film sounds like an interesting contrast/complement to his vision. I think this has definitely been the decade of Chinese cinema and Asian cinema in general. So far, I’ve been deeply impressed with everything I’ve seen, and it seems to capture both an imaginative movement and a societal consciousness which are lacking in American and European films from the era. Great analysis and observations here. Thank you, MovieMan. A terrific decade for Asian cinema indeed. They pretty much OWNED it (except for 2009, where Asia seems to have produced the worst duds). I loved your take on The World and Still Life. Would like to see more. West of the Tracks is actually a different beast altogether. While Asian cinema has mostly produced auteur/art/second cinema so far, this great film actually shows how the DV revolution has set the stage for resurrection of Third cinema. A splendid film that I place in my top 10 of the decade. Alongside Schrader and Rosenbaum, no less! Whoa. I thought they just wanted to bookmark world cinema blogs when Matt contacted me. I still have to go through the full article and their selection process. Any canon of film blogs is questionable and I’m really interested what their criteria were. Thanks MovieMan. This is good to hear. Congratulations my great friend! I have seen your brilliance right from the start, and none of these accolades from the intellectual circles surprise me in the least. Now I feel vindicated for my seemingly embarrassing hyperbole. Your writing is as good as it gets, and if Movie Man sees it that way I am further thrilled. Of course this is yet another review of a vital contemporary sub-genre by an important artist. Sounds like RUST in particular is indispensible. Thanks a lot, Sam. You’re always too kind. I’d say all the three films are indispensable, but REMNANTS is my favorite. Do see it when you can. Congratulations on this great accolade. You deserve all the plaudits. You’ve opened my eyes to new films, to new ways of looking at them, and perhaps most of all, inspired me to improve my own writing. So thanks and well done. Thanks a lot, Stephen. Let me return the same compliments to you. I’ve got so many films on my list thanks to C.O.M.S. Sorry if this comment comes up more than once. I’m having trouble making it stick. Congratulations and have finally book marked you to peruse more often. I have never heard of the film or director obviously, but now have them on my list of to view at some point. Foreign films are always interesting, but enjoy asian a lot, but never know where to go or what to see. Thanks Coffee Messiah. Last decade has been very good for Asian cinema. And it looks like this decade will be pretty strong too. DO see it if you get a chance. Thanks for your writing. This blog introduced me to Jia. I would love to see this movie, but don’t know where to find it. I have looked everywhere (torrent, netflix etc) Any pointers?